Is it not wanting to give away my techniques? Is it not being confident that the finished piece will work? Is it jealously guarding my creative process? Is it that I don’t think it looks very interesting at this stage? Is it because I only like things finished? Is it because I am worried about negative feedback? I suppose it is a bit of all of these things. But it is what you do, in this online making world. You share, you take people into your processes, you involve your audience. And that is what I love about the online making world, so that is what I do. Albeit in a *very* contained way. I’m not exactly giving a lot away with this photo, but that is mostly because this is the tiny piece I’ve been working on today and the rest is exactly the same. And cream doesn’t photograph all that well. So really what I am saying is: here’s a bit of the piece I am working on for the Festival of Quilts. I’m doing stuffed Shibori bobbles densely on organic cotton voile – similar to this piece. Indeed if you click this link I hope it will take you to a Flickr search of all my pieces using this technique which I call Polonaise (for reasons related to 18th century dress). 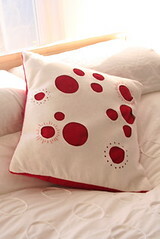 I’ve done about 7 or 8 Polonaise sections all of varying sizes which will be visible through cut out circles in red felt, inspired by this cushion I designed years ago but a *lot* bigger. Fingers crossed the whole thing works! I’m part way through the last circle now so will have to start construction – very scary – in a week or so. It has to be posted to the show organisers in about 3 weeks time. Last year I promised myself I would have it finished way before the deadline this year. ha ha. Luckily I have a week or two longer to prepare myself for the actual show which happens 11-14 August. I have taken a demonstration space in the show this year – a stall where I will be showing my techniques, selling books & things (more anon) and hopefully signing people up for (drumroll….) 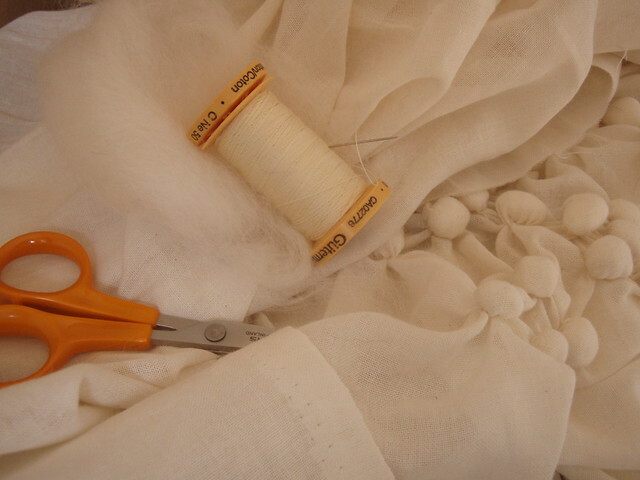 my fabric manipulation workshops in the autumn! Oooh I’ve got a lot of work to get done before then. gulp. I love that cushion. It's the high contrast between bright white and dark red. I hope to be going to the Festival of Quilts again this year. I shall try and find you to day hello again. I can't wait to see you quilt, it sounds fabulous. Looking forward to seeing your quilt. Racing to finish mine (only a miniature). Good to read your blog again. It would be a pity if you lacked confidence in your work, as it looks lovely.